I’m feeling a bit like I never have time to cook. Even now I’m thinking, gah, when did I last cook anything?! 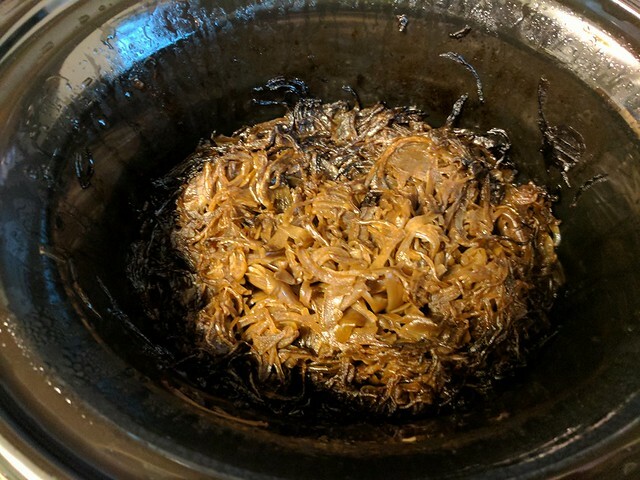 So to remind myself, this weekend, I have caramelised over a kilo of onions in the slow cooker over about 24 hours, resetting the timer every now and again as my too smart for its own good slow cooker has a maximum of 10 hours in one go. Some of these will freeze, some of these will go in a jar in the fridge. There was also a quarter of a pint of delicious juices so I’m thinking French onion soup at some point too. This was just quickly slice a kilo of onions – food processor ftw – bung in slow cooker with a good slosh of EVOO and several knobs of butter, and a similarly large slosh of balsamic vinegar. House smelled amazing for all the time it was cooking. Oh yeah, I made nutribullet pancakes on Saturday morning for a lazy brunch too, nearly forgot. Nutribullet banana loaf got made at some point. For a quick and easy dinner on Saturday night, I stuffed some giant mushrooms with stilton for a delicious starter – I have been meaning to cook this for myself ever since Evil Brian fed them to me on Come Dine With Me and it was really delicious when he did and really delicious last night too. I also fried some pork loin steaks with onions, apples, and red pepper, simmering down with cider and adding crême fraîche and wholegrain mustard at the last minute. 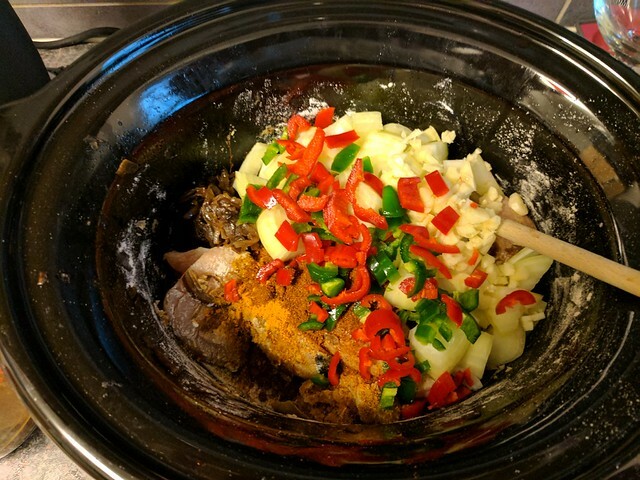 Today I fished the onions out of the slow cooker but didn’t clean it at all – set it going straight again for chicken tikka from a delicious looking video on Facebook. Since I can’t share the video outside of facebook and I can’t guarantee I can find it again, here are the ingredients from the video. I have doubled everything because I have a large slow cooker and I also managed to have a bit of a freezer declutter this weekend too. Cook on high for 3 hours, add 200 grams plain yoghurt after cooking (presumably then bring back up to heat…) and serve with rice. I’ve doubled everything (not sure I’ve ever put 8 cloves of garlic in anything before!) and put in way more tomatoes, since if you’ve opened a tin, you might as well use them all. All ingredients bar the garam masala were in Aldi but I had to make a special trip to Sainsburys for that as Aldi only had curry powder. And I’m still beating myself up about getting nothing done!